Bringing home three national and one state award, Penn Points has proven to have a very successful first year. Penn Manor High school’s Penn Points Online Newspaper, was awarded the national “Pace Maker” award by the National Scholastic Press Association. Several student journalists, Sarah Schaeffer, Taylor Groff, Dessie Jackson and Cody Erb put together a story package that won second place in the Multimedia story of the year by the NSPA. Kendal Phillips and Taylor Groff received an honorable mention in the same category. The newspaper was considered as one of the top 10 student publications in the state when the Pennsylvania Student News Association awarded Penn Points its gold award. It was these stories that made the online publication so successful. The ten top stories that were written in 2010 gave the site a significant amount of views, bringing Penn Points over 125,000 hits in just a year of publication. Number Ten. iPhone vs Droid, the Battle Continues, written by Kyle Hallett, received 710 views this year since it was published on October 29, 2010. This story talked about the rivalry between the two top-selling smart phones the iPhone and the Droid. Number nine. Lady Gaga Thrills her “Monster” fans, written by Whitney Reno, received 720 views since it was published on September 16, 2010. The story was written shortly after Lady Gaga performed at the Wachovia Center, in Philadelphia. Students who attended the concert were interviewed about their experiences. Number eight. As Last Harry Potter Movie Approaches, Excitement Grows, written by Gabrielle Bauman, received 748 views since it was published on November 8, 2010. This story was written about Harry Potter and the Deathly Hallows: Part I. Multiple students share why they were exited to see the midnight release of the new movie. Number seven. Oodles of Noodles, written by Gabby Myers, received 800 views this year. It was published August 30, 2010. The story was about the popular meal called Ramen Noodles, most commonly eaten by college students. In the story, the author and students explain how many other things, besides eating, you can do with Ramen. Number six. L-S Homecoming Dance Canceled, written by Jessen Smith, received 804 views since it was published on October 1, 2010. This story was published before any of the local newspapers, informing the public as to why the dance was being canceled in a neighboring school district. Number five. Steelers Physical Defense Continues Despite Consequences, written by Ryan Mays, received 816 views since it was published on November 28, 2010. This story was written about the illegal head-to-head contact in the NFL. Number four. Attempted Deer Break-in Excites students, Leaves Mess, written by Brian Dunne, Liz Lawrence and Cree Bleacher, received 817 views since it was published on October 29, 2010. The story was published the same day a deer saw itself in the reflection of a window in the school. The deer repeatedly ran into a window, leaving behind a trail of blood. Number three. For Colored Girls-a Review, written by Robert Henry, received 985 views since it was published on November 9, 2010. This article was a review on a movie about twenty people, each of whom represents a character in every one of the twenty poems throughout the movie. The poems represent the daily struggles endured by women of color. Number two. Miley Cyrus, the Newest Falling Child Star, written by Jordann Stekervetz, received a total of 3,804 since it was published December 20, 2010. This story gave Penn Points more views in one day then any other story. The site had 3,183 on the day the Miley Cyrus story was published. This story is about the teen that started her career on the Disney channel, and got caught smoking a bong. Number one. Dangers of Chewing Tobacco Not Needed Here, written by Alex Geiger and David Mohimani, received a total of 7,957 views since it was published on February 23, 2010. This still gets the number one hit on the daily stats almost every day. 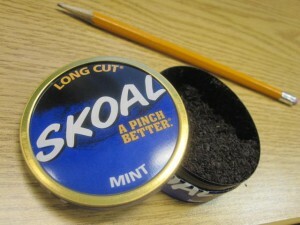 The story was written about the use of chewing tobacco, effects of the use and also the statistics of high school users. Penn Points staff looks forward to another very successful year, gaining more knowledge about journalism and writing more award-winning stories in the coming new year.